New York: Wiley, 1972. First edition. Octavo, original cloth. Signed by Steven Weinberg on the title page. Fine in a near fine dust jacket that shows the lightest of wear. 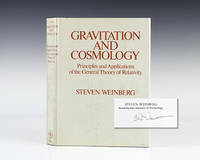 Winner of the 1979 Nobel Prize in Physics, Steven Weinberg's Gravitation and Cosmology was written after his promotion to faculty at the University of California, Berkeley, where he researched on particle physics, such as symmetry breaking, infrared photons, and quantum gravity. It was also during this time that he developed the approach to quantum field theory that is described in the first chapters of his book The Quantum Theory of Fields. Both textbooks are among the most influential texts in the scientific community in their subjects. 1972-07-01. New. Ships with Tracking Number! INTERNATIONAL WORLDWIDE Shipping available. Buy with confidence, excellent customer service! John Wiley & Sons, Inc.. Hardcover. 0471925675 Special order direct from the distributor . New. John Wiley & Sons, Inc.. Hardcover. 0471925675 New Condition *** Right Off the Shelf | Ships within 2 Business Days ~~~ Customer Service Is Our Top Priority! - Thank you for LOOKING :-) . New. John Wiley & Sons, Inc, 1972-07-01. 1. Hardcover. Used:Good. New York: John Wiley & Sons, 1972. An unusually nice, unmarked example of this rather scarce title.. Later Printing (4th). Hard Cover. Near Fine/No Jacket. Large Octavo. John Wiley & Sons, Inc.. Hardcover. 0471925675 Like New Condition. . Fine. John Wiley & Sons, Inc.. Hardcover. 0471925675 New Condition. . New. 1972-07-01. Good. Ships with Tracking Number! INTERNATIONAL WORLDWIDE Shipping available. May not contain Access Codes or Supplements. May be ex-library. Shipping & Handling by region. Buy with confidence, excellent customer service! WSE. PAPERBACK. 8126517557 New Condition. . New. WSE. PAPERBACK. 8126517557 Like New Condition. . Fine. John Wiley & Sons, Inc, 1972-07-01. Hardcover. Good. John Wiley & Sons, Inc.,, 1972. First Edition, Later Printing. . Hardcover. Near Fine/No Jacket as Issued. Used. A small scratch on the back. Otherwise, the book is like new. No highlighting, underlining or any other marks. John Wiley & Sons. Used - Very Good. Great condition for a used book! Minimal wear. Replike Press, 2005. Book. Very Good. Hardcover. Re-issue by an Indian publisher. Clean bright pages, filled with equations. First few pages with reading winkles in lower corner. Leather-design vinyl covers with gold metal caps to corners. .
Wiley India. PAPERBACK. New . New Book. Shipped via DHL/FEDEX with tracking ID. Wiley India, 2009. Paperback. New. Brand New Please Read Notes: Brand New, International Softcover Edition, Printed in black and white pages, minor self wear on the cover or pages, Sale restriction may be printed on the book, but Book name, contents, and author are exactly same as Hardcover Edition. Fast delivery through DHL/FedEx express. Wiley India, 2009. Paperback. New/11. Brand New International Edition, and has never been opened,Perfect condition, Satisfaction Guaranteed !!! Wiley India Pvt. Ltd, 2013. 5th or later edition. Softcover. New. 18 x 24 cm. Preface Notation Copyright Acknowledgements Â· Preliminaries Â· The General Theory of Relativity Â· Applications of Feneral Relativity Â· Formal Developments Â· Cosmology Appendix Some Useful Numbers Index Printed Pages: 678. Mc Graw Hill India, 2015. Softcover. Brand New. Orders usually ship within 1-2 business days. We use FAST SHIPPING via FEDEX/UPS/DHL and deliver within 3-5 business days with tracking number, no shipping to PO BOX, APO, FPO addresses. Kindly provide phone number for expedite delivery. 100% Customer satisfaction guaranteed! Wiley India, 2009. Paperback. New. 2009. Brand New. "International Edition". ISBN number and front cover may be different in rare cases but contents are same as the US edition. Printed in black & white in English language. Territorial restrictions may be printed on the book. WE DELIVER FAST WITHIN 3-5 DAYS to US, Canada, UK, Australia, Germany, Mexico, Italy, Spain, Netherlands, Denmark, France, Hong Kong and Belgium via DHL/FedEx/Aramex Express service. Kindly provide day time phone number in order to ensure smooth delivery. No shipping to PO BOX, APO, FPO addresses.We may ship from Asian regions for inventory purpose.100% Customer satisfaction guaranteed! Wiley India, 2019. Paperback. New. Brand New, Never Used, IN-STOCK, Well Packed. Orders ship the same or next business day. Shipping should take from 3-4 business days within US, Canada, UK, and other EU countries, 2-3 business days within Australia, Japan, and Singapore. Customer satisfaction guaranteed. Mail us if you have any questions. WSE. PAPERBACK. 8126517557 . New. WSE. PAPERBACK. 8126517557 Item in good condition.No Marking.Covers could be Little damaged . Textbooks may not include supplemental items i.e. CDs, access codes etc.. . Very Good. John Wiley & Sons, Inc.. Hardcover. 0471925675 Brand New Paperback International Edition. Fast Delivery. Same Contents as US Editions. ISBN and Cover might be different in some cases. Delivery in 4-14 Business days . New. Brand New. "International Edition". ISBN number and front cover may be different in rare cases but contents are same as the US edition. Printed in black & white in English language. Territorial restrictions may be printed on the book. WE DELIVER FAST WITHIN 3-5 DAYS to US, Canada, UK, Australia, Germany, Mexico, Italy, Spain, Netherlands, Denmark, France, Hong Kong and Belgium via DHL/FedEx/Aramex Express service. Kindly provide day time phone number in order to ensure smooth delivery. No shipping to PO BOX, APO, FPO addresses.We may ship from Asian regions for inventory purpose.100% Customer satisfaction guaranteed! WSE. PAPERBACK. 8126517557 Very Good Condition.Access codes and supplements are not guaranteed with used items. No highlighting and No markings.Covers could be repaired or might have self wear sign . Very Good. WSE. PAPERBACK. 8126517557 Brand New, printed in english , 100% same as Listed ,Ready to ship, fast delivery (5-8 busienss days ) worldwide . New. Softcover. New. Brand NEW, Paperback International Edition. Black & White or color, Cover and ISBN same with similar contents as US editions. Standard delivery takes 5-9 business days by USPS/DHL with tracking number. Choose expedited shipping for superfast delivery 3-5 business days by UPS/DHL/FEDEX. We also ship to PO Box addresses but by Standard delivery and shipping charges will be extra. International Edition Textbooks may bear a label -Not for sale in the U.S. or Canada- etc. printed only to discourage U.S. students from obtaining an affordable copy. Legal to use despite any disclaimer on cover as per US court. No access code or CD included unless specified. In some instances, the international textbooks may have different exercises at the end of the chapters. Printed in English. We may ship the books from multiple warehouses across the globe, including India depending upon the availability of inventory storage. In case of orders from Europe, custom charges may comply by the relevant government authority and we are not liable for it. 100% Customer satisfaction guaranteed! Please feel free to contact us for any queries. John Wiley & Sons, Inc.. Hardcover. 0471925675 Brand New, Paperback , International Edition , Same text as US edition ,Different ISBN, Cover , printed in english , Ready to ship, fast delivery (5-8 busienss days ) worldwide . New. WSE. PAPERBACK. 8126517557 Brand New, Paperback , printed in english , Ready to ship, fast delivery (5-8 busienss days ) worldwide . New.